Chad is a self taught potter, starting with a 5 minute lesson from Kiesha's father, shortly after they met. It was love at first sight, in more ways then one. He continued to learn through videos, workshops and practicing whenever he could developing his skill and form along the way. Over the years he decided he didn't have the patience to work in stoneware. Raku is fast paced and thrill a minute, but seemed to lack diversity in the finishes and raku finishes typically change over time, usually losing their flash or appeal. Working with a local group doing an occasional wood firing, led him to thing about atmospheric firings and the effects achieved from them. In 2005 he began to look at pit firing and the origins of pottery. While looking for someone to collaborate with in a pit fire, he continued to read and surf the net learning about glaze-less finishes and firing processes. In 2008 he was able to attend a alternative firings workshop with Charlie and Linda Riggs where they introduced him to saggar firing, including foil saggars, and pit firing. That first pit fire nearly turned into a real "Burning Down the House" moment. Chad was hooked, and one month later he did his first solo firing and has been continuing ever since. 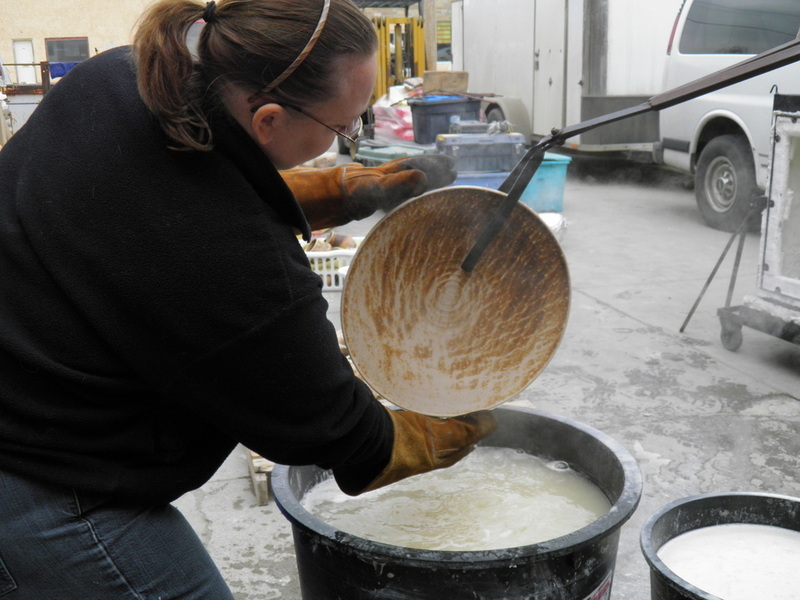 Kiesha grew up in the ceramic/pottery world with her parents owning a pottery supply shop and a clay manufacturer. She does hand building and creates most of the saggars. Kiesha has a degree in Elementary Education and helps with the programming of workshops for the kids as well as the adults. Up in Smoke Pottery is located in basement and garage of Chad & Kiesha's home in Sioux Falls, SD. They started selling their pottery in late 2008 when they ran out of room in the historic 4 square. They participate in a few festivals and shows each year winning several awards along the way. They also have a few select galleries in which they distribute their work.